VStar Entertainment Group Debuts "Dinosaur Time Trek: Shark Edition" and "Dinosaur Time Trek: Dragon Edition," Two All-New Interactive Experiences Touring the U.S. Calling all budding paleontologists, shark lovers and dragon enthusiasts! VStar Entertainment Group, a leader in live family entertainment, today announced the debut of Dinosaur Time Trek, two all-new interactive experiences that begin touring the U.S. in December 2017: Dinosaur Time Trek: Shark Edition and Dinosaur Time Trek: Dragon Edition. Dinosaur Time Trek: Shark Edition features dinosaurs and life-sized shark models spanning from prehistoric to present day. Present-day shark content showcased is curated by tour partner, OCEARCH, a non-profit organization with a global reach for unprecedented research on great white sharks and other large apex predators. Dinosaur Time Trek: Dragon Edition features animatronic dinosaurs, and dragons from three different cultures. To start trekking, guests can visit DinosaurTimeTrek.com for a list of upcoming Dinosaur Time Trek tour cities, dates, times and ticket information. "More than ever, people are seeking immersive and experiential family entertainment, and specifically those experiences that engage the family as a whole," said Eric Grilly, CEO, VStar Entertainment Group. 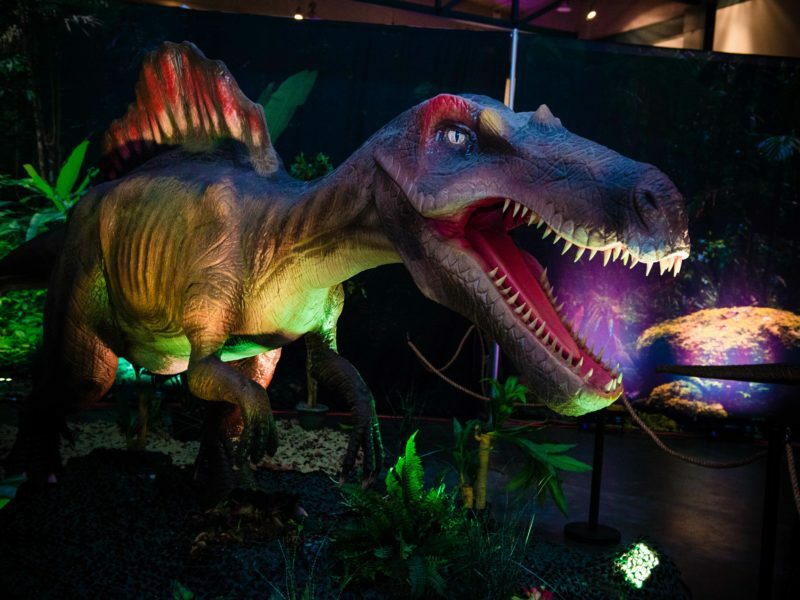 "Whether they're digitally scanning fossils to discover what dinosaur bone they've found, solving the Race Though Time Labyrinth or using our 'eggs-ray vision' technology to see inside a dinosaur egg, Dinosaur Time Trek is an interactive attraction that offers memorable experiences through genuine engagement, and it provides hands-on and educational fun for the entire family." Dinosaur Time Trek: Shark Edition will feature life-sized shark models including the 16-foot OCEARCHGreat White shark, Mary Lee. Mary Lee is just one of the many real-life sharks that guests can track in real-time, using the interactive OCEARCH shark tracker. Dinosaur Time Trek: Dragon Edition will invite guests to meet multiple dragons inspired by folklore throughout history. Dragon lore is thought to have come out of early discovery of Dinosaur bones! Visit DinosaurTimeTrek.com for more information. Follow DTT on social media at #dinosaurtimetrek. VStar Entertainment Group is one of the leading multi-concept entertainment platforms, producers and promoters of family-friendly theatrical productions, exhibits, installations and events. Headquartered in the Twin Cities, VStar has presented more than 36,000 performances worldwide over the past 38 years, touring across 40 countries and entertaining nearly two million guests annually. The company owns, operates and promotes tours across the U.S. and internationally, including PAW Patrol Live!, a high-energy musical adventure based on the hit animated series that airs on Nickelodeon and is produced by Spin Master and Cirque Dreams, which combines a cirque-style of performance artistry with Broadway theatrics; and Dinosaur Time Trek, an interactive prehistoric-themed educational exhibit with attractions for the whole family. OCEARCH shares real-time migration data through OCEARCH's Global Shark Tracker. OCEARCH also inspires current and future generations of explorers, scientists, and stewards of the ocean through its STEM Learning Program. The free STEM Curriculum, available for grades K-8 and created in partnership with Landry's, Inc. enables students to learn STEM skills while following the real-time data on the movements of their favorite sharks. In partnership with Costa Sunglasses and YETI, the researchers OCEARCH supports work aboard the M/V OCEARCH, a 126' Cat-powered vessel equipped with a 75,000 lb. hydraulic research platform, where the ship serves as both mothership and at-sea laboratory. Scientists have approximately 15 minutes of access to live, mature sharks to conduct up to 12 studies. The sharks are measured, tissue and blood samples are collected, and satellite and acoustic transmitters are attached. More than 160 researchers from 89 regional and international institutions have partnered with OCEARCH.